Looks like a very nice pipe. As for cleaning the gourd, I'm not sure there are any "rules" per se'. I've always just cleaned mine out with a dry paper towel. And, used a dry bottle brush that you can bend to clean the crook. Basically just dusted it out. I've never had any real residue or build up in the gourd. After many years, my recent acquisition of Gary Schrier's History of the Calabash Pipe, 2nd Edition, (http://www.briarbooks.com/Order.html) and the persistent itch for another Gourd Pipe in my collection, I've given in to the Calabash siren's call. My tastes tend to the simple lines of this shape and past experience has taught me that smaller is better when smoking one of these awkward Pipes. It is the Gourd that allows this Pipe to provide a cool & dry smoke, not the bowl. Mahogany Calabash Pipes look similar but the wood flavors the smoke and you never really can clean them properly. The Gourd imparts no flavor to the smoke and allows cleaning..., not conveniently as I would like but still feasible. Strambach has been around since 1904 and is still in the same family ownership. http://www.strambach.at/anfang.html & http://www.pipedia.org/index.php?title=Strambach Measuring in at 6" in length and 5" in height this one appeals to both my practical and aesthetic tastes. The Gourd colors with use. It is absorbent, which serves to cool and dry the smoke but it results in the eventual demise of the Pipe. The weakest part of the Pipe is the point where the ferrule joins the Gourd so care must be taken to avoid unnecessary stress to this area. The bit should be removed by grasping the ferrule and twisting the bit free. During the smoke, it's preferable to grasp the Pipe by the Gourd... Clenching the smaller Pipes is easier but will fatigue the jaw. When the Pipe is not being held, it's a good idea to use a stand to support the Pipe in an upright position. After the Pipe has been smoked and allowed to cool, it's a good idea to remove the bowl and allow the Gourd to dry overnight. Cake buildup in the bowl should be kept to a minimum and the goo that accumulates beneath the draft hole should be trimmed back from time to time. These Pipes can be smoked heavily and are prized for their ability to tame the most unruly blends. Eventually, the Gourd's interior will require cleaning, to continue providing a good smoking experience, as it will wind up with a lot of the debris of smoking. A doubled over Pipe cleaner with some Everclear can be used for a gentle scrub, after which the Gourd should be allowed to dry overnight. It is the Gourd's chamber that allows these Pipes to provide the cool, dry smoke that they are prized for. The different materials used to make the bowls seem to make little difference in the smoking qualities of this style of Pipe, whether they are Block or Pressed Meerschaum or Gypsum. Other refinements in trim, the materials used to make the ferrule and the bit are all nice but really contribute little to the character and quality of the smoking experience. Personally, the simplicity of design of the Strambach Calabash appeals to me over that of the more ornate Pipes also available. Remove the bowl and stem from the gourd and set that aside. Find a nice bowl or glass that will allow you to stand the gourd "up" in. Fill the gourd with regular table salt or Kosher salt. Then pour some grain alcohol like vodka (I use isopropyl alcohol) in the gourd until all of the salt is saturated "a mushy mixture." Let this mixture sit for at least 24 hours. The salt draws all of the impurities out of the gourds walls. Scoop out all of the salt (it'll be pretty dry by then) shake the pipe a little to get more salt out. Then pour a little more spirits in the bowl and swish it around. Pour it out via the stem hole. Take a rag and twist it in and down through the gourd until it looks pretty dry and clean inside also making sure that you wipe the "cork" gaskets very well (you don't want these to swell.) Let it air dry for about two days. To harden the bowl, turn the bowl upside down and take a lighter or match to the black deposits clinging to the bottom of the bowl until they light by themselves. This hardens the meerschaum and helps prevent its deterioration by running cleaner through the bowls bottom hole and or reaming. Do NOT replace the bowl back into the gourd after filling it with the salt/alcohol mixture. The bowl WILL crack, irreparably. After looking it up in Gary's new book, he mentions the salt alcohol treatment (using Kosher salt), but states that he's not tried it, preferring instead to simply fill the Gourd with high alcohol beverage to the level that you want to clean. He makes a point of caution by advising to keep the alcohol away from the cork gasket. Gary lets the Gourd soak for a couple of hours, does a bit of scrubbing before pouring the alcohol out, using the ferrule end, followed by mopping up the residual goop with Pipe cleaners and paper towels. After letting the Gourd dry out overnight, it will be ready to go back in service. He goes on to say that Calabash Pipes with fixed bowls anchored in the Gourd cannot be cleaned, which he doesn't regard as a problem since cleaning is optional as long as the Pipe is smoked at least infrequently. 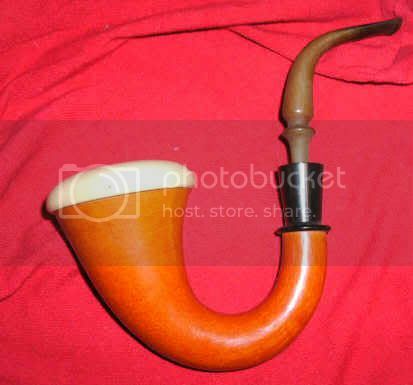 The Calabash Pipe has two parts: the meerschaum cup and the gourd. It is better not to take off the meerschaum cup very often becauce the cork ring which connects the cup with the gourd will loose its flexibility. The condensation inside of the cup which comes after long smoking you can remove with a special tool, but do it with care otherwise it can break. Dont use any cleaning fluid. On the interior of the gourd the residues of the condensation grow mellow after a long time smoking and you cannot remove them without destroying the gourd. You can see that the pipe prevents most of the condensation to come to your mouth. The mouthpiece should be cleaned from time to time by a good pipe cleaner. Bent the cleaner a little bit than you can better clean. Please never use any cleaning fluid for the cup and for the gourd. Let the pipe breathe on a safe place for some time then the bad odors will disappear. Have a good smoking but please give your pipe time of recreation. My thoughts on Strambach's response are: I prefer smoking a clean Pipe. In the past, I've used Everclear to scrub the Gourd interior and plenty of Pipe cleaners, with good result. I've not tried an alcohol soak or using a retort, but I've not been dealing with a Pipe that had decades of neglect either. I suspect Strambach advocates a laissez-faire approach to cleaning their Gourd Calabash Pipes in an effort to avoid responsibility for unskilled efforts that produce disastrous results. In this day and age we find warning stickers on nearly every product sold..., and there are plenty of reasons for this. If I were manufacturing and selling Gourd Calabash Pipes, I'd take the same position rather than have to replace Pipes for guys who attempt to clean one with the skill set of a ham-fisted baboon. I plan on routine care and maintenance as needed, with the goal of a good smoke so that I don't have to attempt aggressive restoration. Prevention is best. Fred, thanks for that information. Have you heard of using carnuba wax on the exterior of the bowl to keep that shiny look? And would you use carnuba on the exterior of the gourd? Just another Oregon tuna fisherman. Thanks Fred, as always a wealth of knowledge and a few differing opinions. So, I have questions concerning the use of a calabash. I just acquired a vintage in really awesome condition and have taken the care of cleaning it thoroughly. 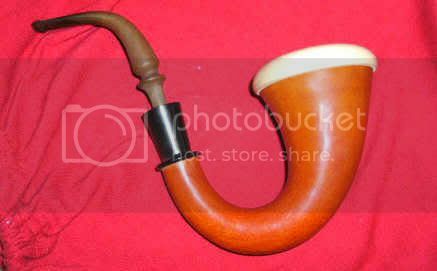 In the articles I read here its stated repeatedly to not smoke the calabash as frequently as say a briar pipe, so that is my first question? Second, from the sound of the article posted the gourd is going to be the first thing to go from moisture, so why clean it with alcohol a liquid? I was just gifted a calabash, which of these methods would you use to clean the pipe? Mine is pretty old and the stem is very oxidized, so I will at least deal with that. I also have the same question as tokerpipes, anyone wish to weigh in? Seeing as I just bought a new Gourd Calabash, I was doing some hunting on how to properly clean and maintain the pipe, and came across this thread. It is an old one, but contains some great information. Figured I would resurrect it for the good of the community. Opening up an old thread here.....what does the piping community have to say about cleaning/care of a calabash made of briar? I naively assume the answer would be that of any other briar pipe but since I've never owned a calabash I wanted to get some sound advice. @pianopuffer What sort of briar 'bash is it, is it like the Briarworks type with a removable bowl and a large chamber underneath? Basically, yeah. I was gifted a Mimmo Provenzano calabash "collection" edition pipe. It is made of briar with a cherrywood removeable bowl. Not magnetic like Briarworks, however. It's the nicest pipe I own, so I'd like to take great care in keeping it in tip top condition. Nice, Mimmo does good work. In short yes clean it like any briar pipe, and to clean the inside of the "gourd" chamber use cotton swabs dipped in everclear followed by dry paper towels until clean. I think Mimmo's have a rubber gasket, if so be careful to keep the alcohol off of it. These things will probably work better for you than ordinary qtips. Thanks a lot, I believe you're right, the gasket is rubber, so no alcohol near there for sure. Good call on the amazon link: tons of uses for those things!